Posted Jan 25, 2019 by Eds. Large-scale instances of violence were reported on Saturday when French riot police went on a rampage against the Yellow Vests protesters in different parts of the country. This was the tenth consecutive week of the protests since November 17. According to reports, a number of people, including women and journalists, were seriously injured in the clashes between the police and the yellow vests. The police crackdown happened in the wake of the government’s proposal for a fresh legislation to contain the allegedly unsanctioned protests. In the aftermath of the protests which took place in the first week of January, French prime minister Edouard Philippe announced plans to draft a new legislation to punish people who hold unsanctioned protests. He also said that 80,000 members of the security forces would be deployed for the next wave. According to reports, thousands marched in Paris, Marseille, Toulouse, Bordeaux, Rennes, Lyon, Perpignan, Clermont-Ferrand, Vitry le François and many other parts of France on Saturday. 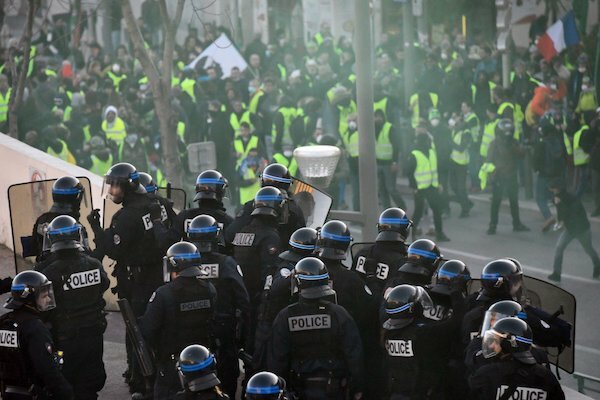 The Local France reported that the “Disarm” collective, a local group that campaigns against police violence, had counted 98 cases of serious injuries till now, including 15 cases of people losing eyesight to rubber bullets. Meanwhile, French president Emmanuel Macron launched his “Great National Debate” on Tuesday, January 15, in the hope of quelling months of anti-government unrest. It consisted of a series of public forums that invited voters to express their concerns and hopes amid the two months of anti-government protests. But reports show that Macron’s new initiative will not have the desired impact as as tens of thousands are still protesting, even after two months. Even though the pro-government media claims that the participation in the protests is shrinking, the ground reports say that there is no significant reduction in people’s discontentment with the regime. The Yellow Vests movement began on November 17 after the Macron-led government announced a hike in fuel taxes, purportedly to combat climate change. This decision triggered the anger of the masses against all the anti-poor reforms that Macron has passed since taking office. In the face of huge mobilizations, the government was forced to roll back the tax hike. In addition, Macron also announced tax cuts for pensioners and asked bosses to give bonuses to their workers. But these small overtures have failed to placate the anger of the working and lower middle classes. Since his inauguration, Macron has been promoting pro-austerity measures, curtailing workers rights, implementing harsh policies on immigrants and refugees in the garb of silencing ultra-right’s criticisms, reducing budgets for education, etc. Workers, women, youth and students had hit the streets in the country on multiple instances. But, at every instance, Macron had shrugged off the demands raised by such groups. Amid the austerity, Macron also batted for tax cuts for big businesses in the garb of attracting investments. Meanwhile, corporate media hailed Macron as the global champion of environment and climate, who did not hesitate to increase the fuel charges and the carbon tax imposed on fossil fuels. But such a move proved to be a rupture through which all the anger and discontent in the society poured into the streets. Earlier, Cyril Benoit, from Young Communists Movement of France (MJCF), had told Peoples Dispatch that the “Yellow vests movement is not just about fuel tax hike, it is a crystallization of a deep social discontent and distress”. Such a crystallized discontent among the people seems inextinguishable in the near future. The ultra-right wing components in the society are trying to push the protests towards a single agenda–ousting Macron. They are also aiming for electoral dividends by channelizing the protests against refugees and immigrants, thereby polarizing the country. The enthusiasm of ultra-nationalists like Marine Le Pen gave Macron an excuse to crack down on the yellow vests by calling them violent, hate mongers, etc. But the ‘left’ in France, while still unable to assume leadership of the yellow vests, is taking many efforts to orient the protest to achieve much-needed social reforms in the country. They are actively organizing mobilizations of working class, students, youth, etc., on the sidelines of the larger movement. They are aware of the fact that just replacing Macron will not solve the problems faced by the common people. On January 18, 2019, a book hit the stands in the country, written by French journalist, Vincent Jauvert, titled The Untouchables of State: Welcome to Macronie. The book uncovers the nexus of financial enterprises run by French elites who form Macron’s core support group. Another work by a young lawyer, Juan Branco, titled Crepuscule, also became viral on the internet. This work also states that Macron has been handpicked by elite business groups in the country to run the government in a way as to cater to their business interests. Earlier, various economists had contributed to a book, titled The Macron Imposture–a Business Model at the Service of the Powerful, which speaks about the “cold and cynical management of public affairs” taking place at the top of the state with the arrival of a contingent headed by Macron. In such a state of state of affairs, replacing Macron with another proxy of the neoliberal deep state will not yield the much needed justice and equity. The deep state, run by French billionaires, who are able to put forward their agents such as Emmanuel Macron on demand, has to be exposed and dismantled at the hands of people. Only then will the yellow vests movement, one of the largest and popular mobilizations in the history of France emerge as a truly transformative moment.